Uh oh, The Twilight Saga: New Moon finally hit theaters this weekend to an estimated $140.7 million total, putting it in 3rd place behind The Dark Knight ($158.4 million) and Spider-Man 3 ($151.1 million) on the opening weekend box office chart. It was also the first to set the midnight record earning some $26.3 million on Thursday night as well as setting the biggest Friday one-day box office record, which raked in some $72.7 million on that day alone. But then all the Twihards decided to get some sleep and it died off to settle in 3rd place just below two other big blockbusters for the weekend overall. Phew! That's just really annoying if you ask me. But I suppose I should never underestimate those Twihards, right. I'm a huge fan of the books and the images in my head while reading them were/are so much better/cooler than the movies. Of course the source material is super cheesy to begin with (there's no doubt about that), but it still made for a captivating/fun read. Now the movies are a different story all together. I'm still utterly annoyed with the cast and their lack of talent, but whatever. New Moon is definitely better than its predecessor. However, that's not to say it's a great movie though. Let's remember the bar for Twilight was set pretty low (try the ground), so naturally this human/vampire love saga, New Moon has no where else to go from here except up. Under the more assured hand of director Chris Weitz (The Golden Compass, About a Boy), who took over the reigns from Twilight director Catherine Hardwicke (thank goodness), the film can at least boast the gloss and shine of a real Hollywood movie and not some straight-to-video hack job. Better visual effects, more accomplished camerawork, improved production design and a more seasoned cast all add up to a vast improvement in production values for New Moon. Plot:Bella recovers from the vampire attack that almost claimed her life in Twilight, she looks to celebrate her 18th birthday with Edward and his family. However, a minor accident during the festivities results in Bella's blood being shed, a sight that proves too intense for the Cullens. Edward, along with his family decide to leave the town of Forks, WA for Bella's sake. Initially heartbroken, Bella finds a form of comfort in reckless living as well as in her best friend Jacob Black which comes close to filling the void that was left by Edward. I’m here, and I love you. I have always loved you, and I will always love you. I was thinking of you, seeing your face in my mind, every second that I was away. When I told you that I didn’t want you, it was the very blackest kind of blasphemy." -Edward CullenAnd what was with the CGI wolf effects? Did you see District 9 this summer? If so, you know it's possible to create fascinating, realistic CGI characters on a minimal budget. The wolves in New Moon are totally laughable. They look fake, move fake, and jarred me completely. The people in the theater, myself included, laughed at the dramatic scenes that were unintentionally funny, i.e. the first appearances of the CGI wolves. Hardly any of the Twilight fans clapped at the end and I overheard more than one person expressing their dislike for the way the movie wrapped up. The Good? The acting was a tad bit better this time around. Michael Sheen, of course, steals any scene he's in, Anna Kendrick is the best of the young group as the snotty, fake friend of Bella's, and Taylor Lautner handles the lead far better than you'd expect. I felt the onscreen chemistry was better between Kristen Stewart and Lautner than it was between Stewart and Pattinson. We can just blame the Twilight director for that though. Also better this time around are the make-up jobs done on the Cullen family. 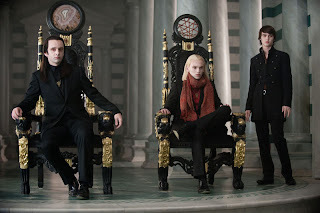 The vampires don't look as pasty and weird in New Moon as they did in Twilight, although I wish someone would have chosen a different wig for Jasper. What the heck was that all about? It was ridiculous! And the fight scenes are shot better giving it a more threatening and realist vibe to New Moon as compared to the big fight scene between Edward and James in Twilight. With that being said, if you liked Twilight (barf, vomit, puke), you'll definitely be happy with New Moon. I felt Weitz and writer Rosenberg did a fairly good job retaining the spirit of Meyer's second book without suffocating it to death. Yes there were a lot of cheesy scenes in the film but as a whole it was fun and entertaining. I didn't hate it like I did Twilight, so that was a plus. Would I see it again? I don't care. How would you rate New Moon? loved it for what it was...your review was on spot but since I don't dissect movies like you do I'd have given it a B...love ya!